This example shows how to measure the latency of an audio device. 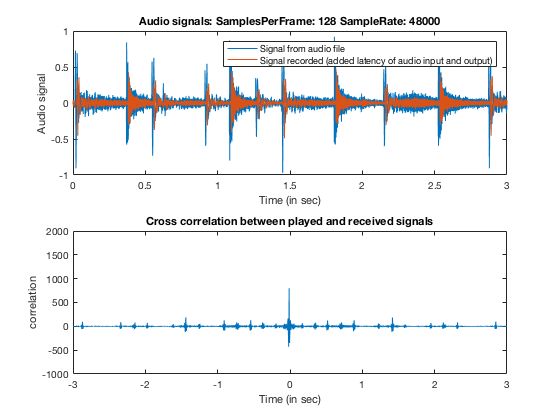 The example uses audioLatencyMeasurementExampleApp which in turn uses audioPlayerRecorder along with a test signal and cross correlation to determine latency. To avoid disk access interference, the test signal is loaded into a dsp.AsyncBuffer object first, and frames are streamed from that object through the audio device. This example shows how to measure round trip latency. That is, the latency incurred when playing audio through a device, looping back the audio with a physical loopback cable, and recording the loopback audio with the same audio device. In order to compute latency for your own audio device, you need to connect the audio out and audio in ports using a loopback cable. Roundtrip latency does not break down the measurement between output latency and input latency. It measures only the combined effect of the two. Also, most practical applications will not use a loopback setup. Typically the processing chain consists of recording audio, processing it, and playing the processed audio. However, the latency involved should be the same either way provided the other factors (frame size, sampling rate, algorithm latency) don't change. Smaller frame sizes and higher sampling rates reduce the roundtrip latency. However, the tradeoff is a higher chance of dropouts occurring (overruns/underruns). In addition to potentially increasing latency, the amount of processing involved in the audio algorithm can also cause dropouts. % ASIO drivers should result in similar values. Trial(s) done for frameSize 64. On Windows, you can use the asiosettings function to launch the dialog to control the hardware settings. On macOS, you should launch the Audio MIDI Setup. Trial(s) done for frameSize 96. % latency is 3*SamplesPerFrameIncrement/SampleRate (macOS only). Trial(s) done for frameSize 128. % indicate about 4.3125 ms latency due to device-specific factors. Trial(s) done for frameSize 32. % 961-tap linear-phase FIR filter vs. the minimal achievable latency.